In two years since its release, the sales don't stop. Minecraft is one of those games most people have at least heard of even if they're not into videogames. In that case, it's unsurprising the sales keep growing. IGN reports the franchise has sold 33 million units across all platforms, and the PC version has now sold over 12 million copies. Along with future releases on the Xbox One and PS4, sales are likely to continue increasing. With mobile versions of the game in addition to versions on consoles, PC, Mac, and Linux, it's likely people have bought different versions of the game. The PC version has the most units sold, and the counter for PC game sales on the website continues to rise. When the game was released on the Xbox 360, it sold four million copies in five months. 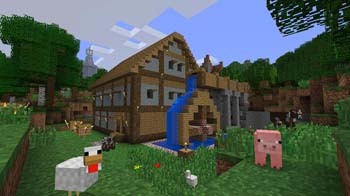 Additional iOS apps for Minecraft include papercrafting, designing skins, and finding the best seeds. The site states the game is "about breaking and placing blocks. At first, people built structures to protect against nocturnal monsters, but as the game grew players worked together to create wonderful, imaginative things." The popularity of Minecraft stems from its open-endedness, including numerous mods. Publisher Mojang announced yesterday that Mass Effect DLC would be available for Minecraft on the Xbox 360.